Acne can occur on your face, chest, neck, back and shoulders, which are areas of your body with the largest number of functional oil glands, according to MayoClinic.com. 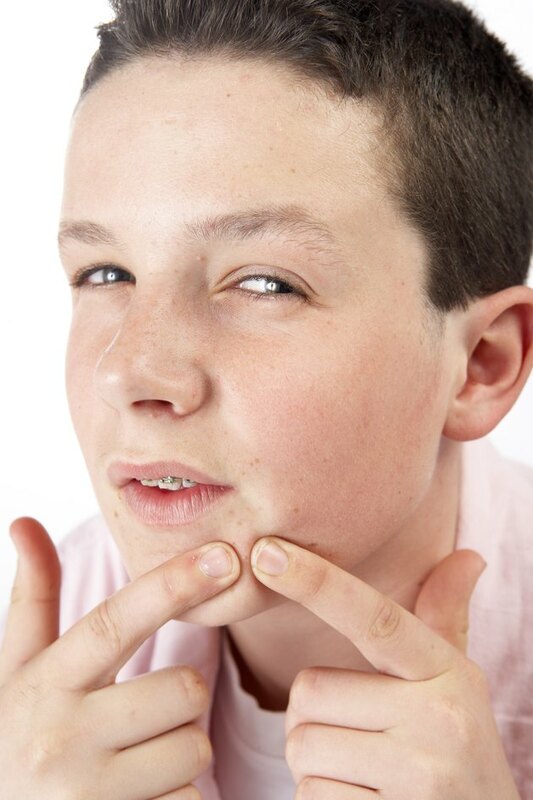 Pimples are more common in teenage boys than adults but acne can occur in men of any age. Due to increased sweating, men are more likely to develop pimples on the chest, neck, shoulder and back. Shaving can also lead to pimples in men. Pimples are not a serious medical condition but you can take steps to prevent their formation. Wash your face twice a day using soap and water or a gentle, oil-free, water-based facial cleanser. Frequent face-washing can help remove oil and dead skin skills. Use a gentle body scrub in the shower to help prevent breakouts on the rest of your body. Exfoliate while in the shower. Use an exfoliating scrub to remove dead skin cells and promote the growth of healthy, new skin cells. Keep your hair clean. Whether you are a man with short hair or long hair, wash your hair daily. Dirt and oil from your hair can be transferred to your face, neck, back and shoulders, especially as you sweat. Try to keep your hair shorter in the summer months to prevent pimples from forming along your hairline. Exercise regularly. Regular exercise can help reduce stress and increase the flow of blood and oxygen to your skin. This can help prevent pimples. Switch to an electric shaver. Electric shavers are least likely to cause cuts, irritation and inflammation, all of which can lead to pimples. Use mildly formulated shaving creams, foam and after-shaves. Harsh products can aggravate your skin, causing pimples. Wear loose-fitting clothes. Tight clothes can trap heat and moisture, which can cause skin irritation and friction against your skin. This can leave your skin more prone to acne. Shower after exercise, sports or performing physical labor because men are more prone to heavy sweating than women. The oil and sweat on your skin can cause dirt and bacteria to become trapped, which can lead to breakouts not only on your face but on your neck, shoulder, rest and back. Avoid touching your face and other areas prone to pimples throughout the day. Bacteria from your hands -- or even the receiver of a phone -- can lead to breakouts. Avoid steroid use. Male athletes who use steroids to enhance muscles and performance are more likely to develop acne than males who do not use performance enhancing drugs. If you seem to be unable to prevent pimples or you are experiencing severe acne, see a dermatologist.